Press moulding is one of the primary manufacturing process used for automotive composite applications today. The process is also used to manufacture parts and components for other industrial and consumer applications. A typical manufacturing chain involves the conversion of composite constituent materials, often using a semifinished product (or preform), into an end-use application. Fully formed parts are molded in matched metal compression molds that give the final part shape; usually these undergo secondary operations such as deburring, hole punching, insert assembly, and, in some cases, painting, and adhesion priming or friction welding for tertiary assembly operations with other parts and components. 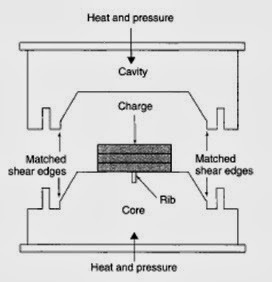 This type of composite component manufacture is based on either thermoplastic or thermosetting matrix materials reinforced, in the overwhelming majority of instances, by glass fibers. Emerging new materials also use combinations with natural fibers and polymeric fibers.